After years of searching and experimenting with different brands, these are my trusted favorites. These are the products I order to view and enjoy my own family photos and keepsake memories. I am very excited to share them with you. They are the perfect way to finish off a photo session and enjoy your memories for years to come. For those who prefer to receive and store their final photos tangibly rather than with just a download. All of the final high-res JPEGS from your session will be loaded onto the JSP branded thumb drive and mailed to you for easy, convenient storage and sharing. SO. CUTE. 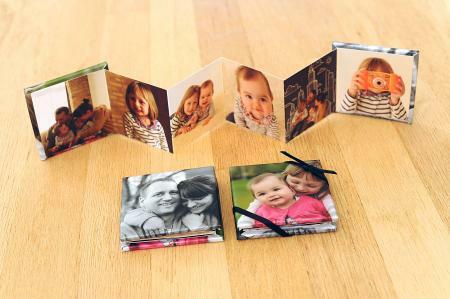 These adorable mini books are a fun, affordable way to enjoy your most recent photos. They are easily toted in a purse, or displayed on a desk. And they come in packs of three…making perfect gifts for grandparents, too. After the session, you choose your favorite 12 images, and I will design, order, and ship them to you. One of my favorite ways to display photos is by having them printed on canvas. I work with a wownderful vendor who supplies high-quality, long lasting, beautiful gallery wraps in every size you could imagine. Please contact me for pricing options. Standard and custom sizes available at affordable prices and professional quality directly from your online gallery. These prints are color calibrated for my computer and editing software, so the quality will be much better than what you will receive from Costco, Walgreens, CVS, Target, Snapfish etc.